MENDOTA HEIGHTS, Minn. — It’s Friday evening, 47 hours before Super Bowl LII will kick off. The Eagles are holding a welcome party for players’ families at their hotel at the Mall of America, but their No. 1 receiver has other plans. About five miles east on Interstate-494, a black SUV pulls up in front of an airport Courtyard Marriott. Out hops Alshon Jeffery. He walks entirely unnoticed past the check-in desk and the grab-and-go bistro, to the utilitarian hotel gym with two treadmills, two ellipticals and a stationary bike. The Eagles’ last practice of the week finished four hours earlier, after which Jeffery stretched and jumped in the cold tub. Then he came here, away from the team’s festivities, for the standing weekly appointment that was a key ingredient in the longest, most successful season of his football career. David Reavy, a Chicago-based physical therapist who flew to Philadelphia once a week this season to treat Jeffery, had arrived in Minneapolis just a few hours earlier. Before Jeffery’s car pulled up, Reavy had secured usage of the hotel gym (it turns out few guests were looking to work out the Friday night before Super Bowl) without any mention of who needed it. Security at the Eagles’ team hotel was so tight that an Army tank was stationed outside—it was easier for Jeffery to take an Uber over here. The Super Bowl was Jeffery’s 19th game of the season, a particularly noteworthy feat for a player who missed significant time due to injury and a PED suspension during his last two seasons in Chicago, a big reason the Bears did not secure him with a long-term contract before he hit free agency last offseason. By December, Jeffery, who just turned 28, had established himself as a building block of the Eagles’ new core, earning a four-year, $52 million extension to stay in Philadelphia through the 2021 season. His season was made even more noteworthy by the news this week, first reported by NFL Network: Jeffery had played every game with a torn rotator cuff, which required shoulder surgery on Wednesday. Nevertheless, Jeffery was feeling so good and so confident Super Bowl week that he channeled his inner Joe Namath, correcting anyone who said if to when the Eagles win the Super Bowl. Two days before making good on that promise with a 41-33 win over the Patriots, Jeffery climbed onto a portable treatment table, wearing a T-shirt, Jordan basketball shorts and black socks, his body about to be pushed, pulled and moved repetitively for the next 75 minutes. “How are you feeling?” Reavy asked. • THE ROOTS OF ‘PHILLY SPECIAL’: From a dusty baseball field to a crumpled napkin, and through the coaching grapevine to the Super Bowl. During Philadelphia’s playoff run, everyone saw Jeffery’s leaping, rotating 34-yard touchdown catch over Patriots cornerback Eric Rowe in the first quarter of Super Bowl LII, and his double move on a 53-yard touchdown catch against the Vikings in the NFC championship game. But behind those plays are hours spent like this, a star receiver lightly grunting and groaning as his traveling physical therapist uses his hands to help his body move as functionally and efficiently as possible, despite pain or injury. Jeffery is one example of players investing more than ever in these small details behind the scenes. Forty-year-old MVP Tom Brady famously has his TB12 method, but top players around the league have their own routines to ward off age, injuries or simply the reality of each collision on the football field being akin to a car crash. It’s not uncommon for players to spend tens of thousands of dollars out of pocket each year, for services beyond what the team offers and that, in many cases, aren’t covered by medical insurance, all in the name of preparing their bodies to perform on Sundays. Elsewhere during Super Bowl week, 39-year-old linebacker James Harrison had a pit crew of therapists from across the country rotating in and out of a room at the Patriots’ family hotel. Monday and Thursday are his acupuncture days, a 400-needle session that’s as extreme as his famous workout sessions. Acupuncturist Lisa Ripi, who has been working with Harrison since 2007, travels from her home base in Long Island to treat 35 NFL players a week; Harrison is so committed to his routine that he pays upfront and asks Ripi to book her travel for his biweekly appointments as soon as the NFL schedule comes out. Chiropractic physician Josh Sandell was working 12- to 14-hour days at his office in nearby Eden Prairie, treating some NFL players who were competing in the game and others who were in town for appearances and sought a postseason tune-up. Jason Witten, the 35-year-old Cowboys tight end, spends seven hours each Monday going through a gauntlet of recovery that includes walking on an underwater treadmill, dry-needling to release spots of tightness, wearing compression sleeves on his legs and the trendy alternative medicine practice of cupping. Falcons defensive end Adrian Clayborn bought his own $24,000 hyperbaric chamber after two of his first four professional seasons were cut short by serious injuries. He spends eight hours in it per week; he’s also part of a group of 15 to 20 Falcons players who chip in so an Atlanta-area chiropractor can travel to all their road games. Harrison said in an NFL Network interview last year that he spends $350,000 a year on maintaining his body. Clayborn spent $3,000 just on those 15- to 20-minute pre-game adjustments and his share of the chiropractor’s hotel and airfare for road games last season. (Players have been able to write these costs off as unreimbursed business expenses, saving about 40%, but under the new tax code taking effect this year they will no longer be deductible). Jeffery’s costs, for Reavy to travel to him and clear a day of his schedule weekly, plus a bonus session the morning of the big game, fell somewhere in between. “It paid off,” Jeffery says. For Jeffery, this was a new addition to his routine, in part because of the shoulder injury. Jeffery’s former Bears teammate, Matt Forte, introduced him to Reavy in 2013, when Jeffery lived near Reavy’s practice in downtown Chicago. That was a breakout season for the second-round pick out of South Carolina, who turned heads with his 1,421 receiving yards and highlight-reel catches. During Jeffery’s last few years with the Bears, though, they hadn’t worked together consistently. Jeffery missed a total of 12 games over the 2015 and ’16 seasons, a result of hamstring and calf injuries and his suspension. He settled for a one-year prove-it deal with the Eagles as a free agent last spring. During training camp, Jeffery texted Reavy: He’d landed on his right shoulder while making a catch and was unable to lift his arm. He didn’t want another contract season derailed. Reavy came out to Philadelphia in late July to work on what Jeffery was calling a shoulder “strain,” until the tear to the rotator cuff (the muscles and tendons that surround the shoulder joint) was revealed publicly this week. Despite the injury, Jeffery sat out only a few summer practices and one exhibition game, and didn’t miss any time during the season. Jeffery caught 69 balls, in fact, including a team-high 12 touchdowns in the regular season and postseason combined. On that touchdown catch against Rowe in the end zone of U.S. Bank Stadium, Jeffery reached his arms high in the air to grab the ball, while rotating and falling on that injured shoulder, no sign of his range of motion or body control being impeded. • HOW EAGLES COACHES CAME UP WITH THE SUPER BOWL-WINNING PLAY: The three minds behind the game-winning touchdown—Doug Pederson, Frank Reich, Mike Groh—explain how the play came to exist. On the treatment table in the hotel gym, his size 13 feet hanging off the end, Jeffery contorts in nearly two dozen positions during the next hour and 15 minutes. Reavy was also dressed in athletic gear, using his hands and the weight of his body as he moved through different joints and muscle groups. He’s looking for restrictions in how the body moves, because of tight muscles or bones that are out of alignment. And he’s using pressure and movement to release them so that the body can move freely and efficiently. 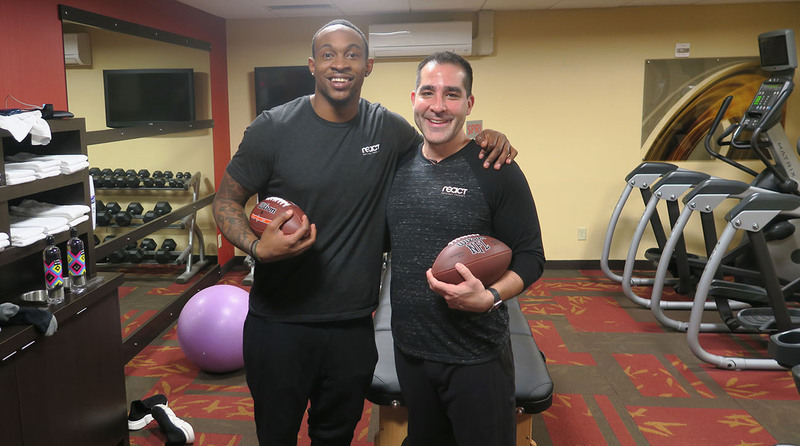 Reavy developed his own method of physical therapy after his experience being hit by a car (an apt allegory for a sport like football) at age 18 and finding inadequate ways to treat his lingering pain afterward. He takes a whole-body approach, based on the idea that everything is connected, so pain or weakness in one area shouldn’t be addressed only at the specific site or just treated with the typical “ice and stim.” During Jeffery’s five seasons in Chicago, he was impeded by hamstring and calf injuries; Reavy helped Jeffery improve his posture, explaining that his slouch didn’t allow him to engage his back muscles, which put a strain on the muscles down the back of his legs. When Jeffery jammed his shoulder, it had its own downstream effects. Reavy has learned to trust what he feels when treating professional athletes, most of whom have unusually high pain tolerances. When he first came to treat Jeffery last summer, he traced the restrictions in his movement down the right side of his body to his pelvic area. How does that relate to the shoulder? The pelvis being properly aligned helps anchor the shoulder blades down the back, to be able to engage the big muscles in your back, which in turn help stabilize the shoulders. At 7:45 p.m., his brothers and cousins peek in through the window of the hotel gym, checking to see if Jeffery is done. “I got one more,” Jeffery says, meaning one more game, a finale he might not have reached if it weren’t for that Friday night work.